I had this old rival crock pot cookbook, and it had this picture of a Korean BBQ Beef short rib recipe that looked delicious. It was so yummy looking that it was just taunting me to try it. So I think to myself, does it use a crock pot? Hooray. Check. Do I like Korean BBQ? Hmmm... Not sure. But I do like Asain flavors like garlic, ginger, and soy sauce, so that's a plus. Do I like beef short ribs? I don't know, I've never tried them. So after two years of staring at this picture every time I flipped through the recipes I was finally compelled to try it. Like right now! What better time to make it then but under the guise of a "new recipe attempt" for my 31 nights of different dinners in January. 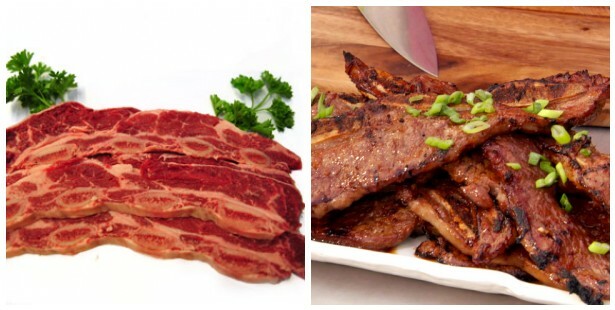 By the way, do NOT confuse these with something called Korean short ribs, sometimes called Kalbi or "Flanken" ribs, which are flat and long with the bones still in them. Now that the fat stubby square short ribs are in the crock pot, it is time to work on the sauce. Chop up 1/4 cup of green onions (I did a little bit more) and toss them in the bowl. Then add 2 teaspoons of minced garlic. Took my little garlic zoom for a spin. I still love that lil' gadget! After that add 2 teaspoons of fresh minced ginger (or 1 teaspoon of ground ginger) and 1/2 teaspoon black pepper. Spices... they are the "spice" of life. Deep thoughts. Okay, stir that around until combined. I was worried this would not be enough flavor or sauce, but the meat cooks down and makes a broth as it slow cooks. Turn your roasting oven or old crock pot to low or around 200º and cook all day about 7-8 hours on low. If you have a newfangled too hot crock pot join my revolution and throw it out the window and go get a roasting oven where you can control the temperatures the old fashioned way (see blog about that here). After 7 or 8 hours on low, the meat should be falling off the bones. This is a good sign. You want to pull the meat out of the liquid and set it on a plate. Let the meat cool slightly and then trim and discard all bones and excess fat. Cut the rib meat into bite-sized pieces and leave on the plate. Mmmm meat. This reminded me a lot of the texture and taste of roast beef. Let the cooking liquid in the crock pot stand five minutes (the same five minutes you are chopping up the meat into chunks) and allow the fat to rise. Skim the fat off the liquid and discard. Now you want to add 2 teaspoons of Asian sesame oil to the liquid. Add the meat back into the sauce and mix to combine. Cover and heat the meat and sauce back up for 15-30 minutes until the flavors meld. During this time make some white rice and toast up your sesame seeds. You can buy sesame seeds already toasted (in the Asian aisle of most grocery stores) or you can buy plain sesame seeds (located in the spice/baking section of most stores) and toast them yourself. I had never done it before so I thought I'd give it a whirl. Put 2 teaspoons of sesame seeds in a dry small frying pan. Turn the heat on medium and keep an eye on the pan. Shake or stir them up every once in a while. They will start to turn a golden brown color. They can go from golden brown to burnt quickly so once you get a golden color pull them off the heat and let them cool. After that it's time to assemble your dish. Put down a scoop or two of white rice. Top with the lovely meat and sauce mixture. Top with sesame seeds and you are done. For an extra fancy presentation, add a few extra diced green onions or some slender onion tops just for show. This turned out really good! Beef short ribs are a bit of a cheaper cut of meat, making this an affordable family meal, and the Asian seasonings really made this dish a winner. Hubby rather enjoyed it as well, and was very pleased it had made the 31 nights of different dinners menu. It also made great leftovers to take to work the next day. Full printable recipe found here. Enjoy! Oh that looks SO good! I miss the Korean BBQ restaurants I used to go to in L.A. I may have to shop for short ribs soon. Mmmm!